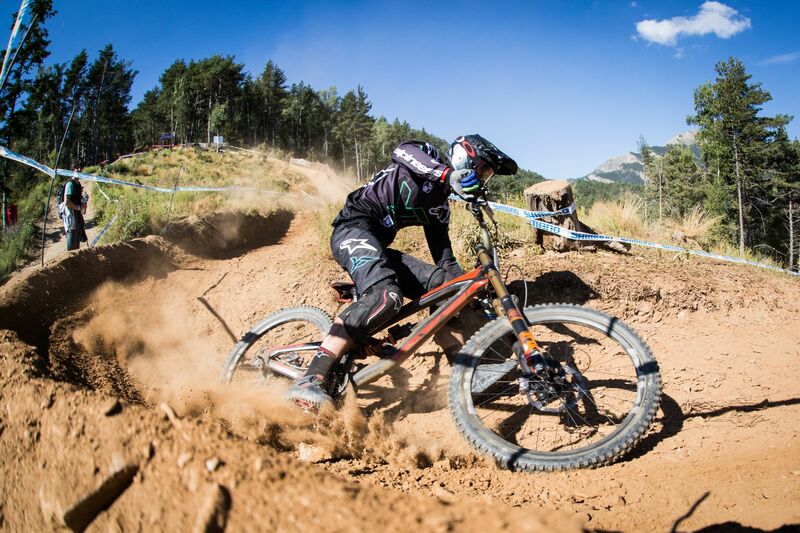 In a dramatic day of racing in Vallnord, Andorra, that saw thunderstorms roll in and dump heavy rain on a dust laden track for just the last few men to come down the hill, Aaron Gwin had to switch from attempting to win the race, to ensuring the World Cup Title. The sun had been out all week and the track was dusty, dramatic and fast. Aaron had a great qualifier finishing 2nd, only 18 thousandths of a second behind Troy Brosnan, but gaining 22 points on nearest rival Danny Hart. This meant the American had a 200 point lead going into the finals, so he just needed to score 1 point if Danny won the main race. 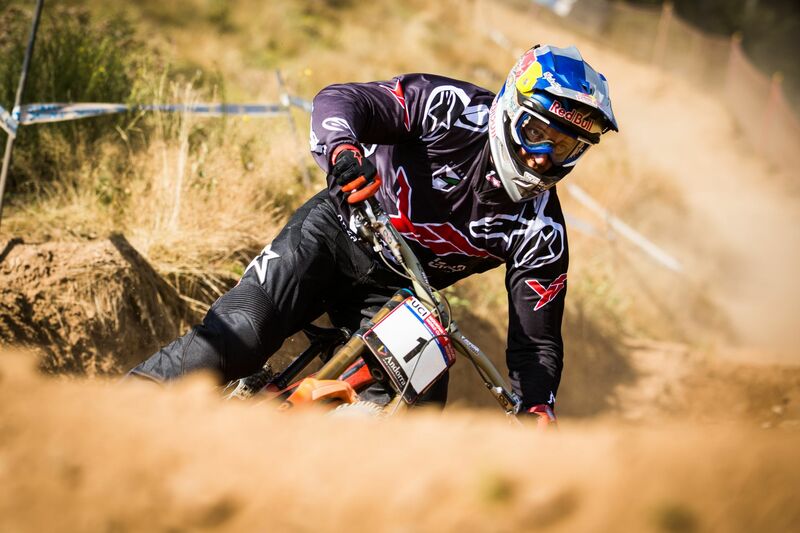 That�s not how Aaron Gwin likes to win World Cup titles; he likes to win the final race of the year and with two excellent practice runs in the dry on the morning of the race, it was looking good. However, 10 minutes before the start of his race, and with Danny Hart safely in the hot-seat, the rain went from light to heavy and changed everything. 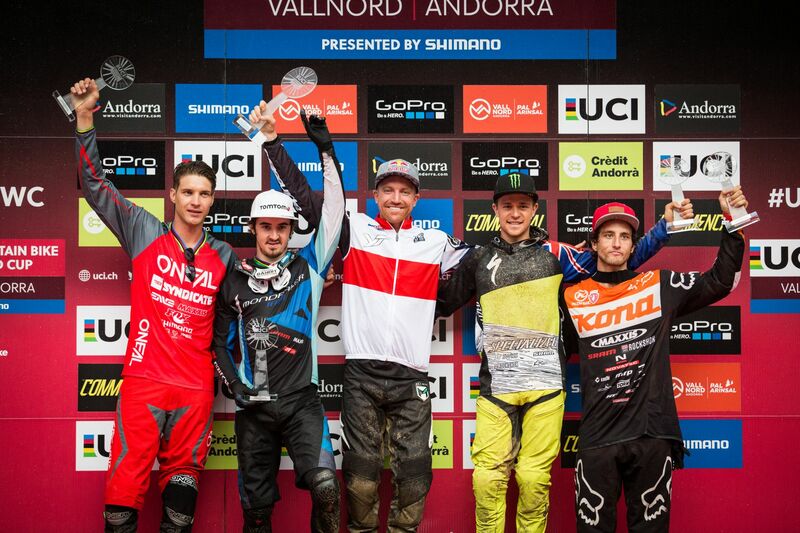 �Another crazy weekend of racing here in Andorra! 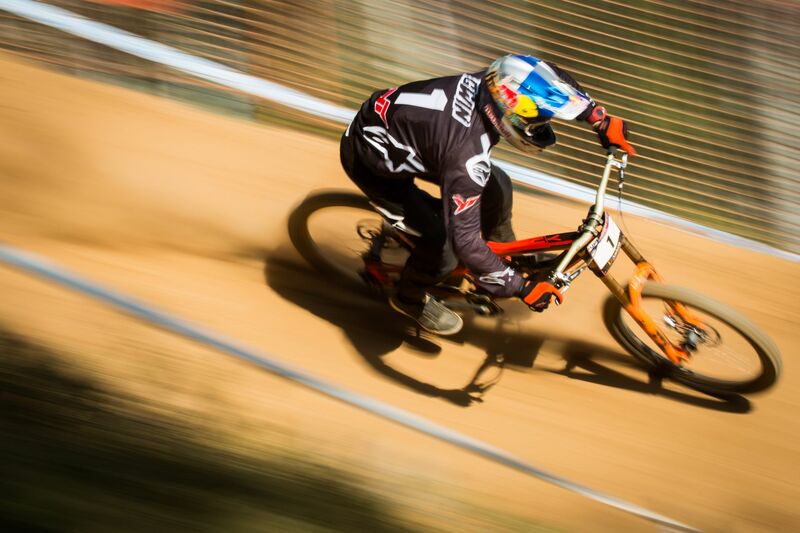 I was really hoping to end my World Cup season with a win but unfortunately the weather just wasn�t on my side today. After dropping into my race run and feeling out the conditions, it was obvious to me that the risk required to ride fast just wasn�t worth it. It was weird not racing for the win but I know it was the wise decision to play it safe, wrap up the title, and stay healthy for the World Championships next week. Other than that it was a great weekend and an amazing World Cup season for me and everyone on the team. I want to say a huge thank you to YT and everyone who supports our team. It�s been an amazing season and I�m so happy to be working with you all. We did it!! Bringing the YT home in 55th place was enough to secure the first World Cup title in the German company�s first attempt, and Aaron�s 4th World Cup overall title in 6 years. Aaron now has more World Cup titles than any of his current rivals, and just one less than all-time record holder, Nicolas Vouilloz who has 5 titles to his name. Unfortunately for teammate Angel Suarez, who had some excellent training sessions with Aaron, suffered some bad luck in qualifying when his chain came off in a rough section, distracting him and eventually crashing. Angel was not injured but failed to qualify. Both riders are fit and healthy, and ready for next week�s all important UCI World Championships in Italy, on the legendary Val Di Sole track.